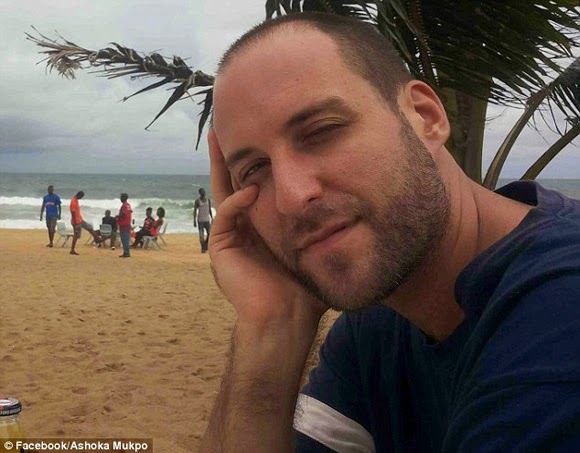 After 33-year-old freelance cameraman for NBC News, Ashoka Mukpo, started feeling achy and tired on Wednesday, he quarantined himself. A test at a Doctors Without Borders facility in Monrovia confirmed that he had Ebola a day after that. Now it has been announced that he will return to the US on Sunday. "The enormous anxiety I have as a mother ... is the delay between now and him leaving on Sunday." "The State Department has been fantastic. They've been compassionate. I can only hope and pray that his symptoms don't worsen." "Obviously, he is scared ... he has been filming what's happening in Liberia for two weeks and seeing the death and tragedy. And now it's really hit home for him. But his spirits are better today." "man oh man i have seen some bad things in the last two weeks of my life. how unpredictable and fraught with danger life can be. how in some parts of the world, basic levels of help and assistance that we take for granted completely don't exist for many people. the raw coldness of deprivation and the potential for true darkness that exists in the human experience. i hope that humanity can figure out how we can take care of each other and our world. simple, soft aspiration for all my brothers and sisters on this earth who suffer the elements and the cold. may we all be free, loved, and tended to..."
The rest of the crew, including Dr. Nancy [Snyderman], are being closely monitored and show no symptoms or warning signs. However, in an abundance of caution, we will fly them back on a private charter flight and then they will place themselves under quarantine in the United States for 21 days – which is at the most conservative end of the spectrum of medical guidance. Omawumi Shows Off Pregnant Belly In New Pictures?